Includes 24 color pencils, 12 color sticks, 12 woodless color pencil, 3 watercolor sketch pencils, 12 graphite pencils, and 5 woodless graphite pencils. Just add your preferred surface and you're ready to create a premier work of art. Royal & Langnickel Sketch And Draw Deluxe Art Set 134 Pieces In A Fine Wood Case. Includes 24 color pencils, 12 color sticks, 12 woodless color pencil, 3 watercolor sketch pencils, 12 graphite pencils, and 5 woodless graphite pencils. This fantastic set of 72 Coloured Pencils is ideal for any artist, or creative project. These pencils have been made to the highest of standards, which makes them usable for soft & delicate designs, or bold & firm artwork, as well as layering, or blending.The plastic carry case folds up in to 3 parts, revealing 24 pencils per part, whichmakes for easy transporting and storage. When you receive them! PRODUCT DETAILS. Royal & Langnickel 'Keep & Carry' Artist Set. ~~ Sketching Artist Kit ~~. Includes: 12 graphite pencils, 1 eraser, 1 sharpener, and 1 drawing pad. 50 Colored Pencils for artists and illustrators of all ages. - Subtle colors with a variety of shade and hue variations. Add to Favorites. - Features color coordinated barrels matching each lead. Colors may vary slightly as it is hard to get an exact color in photos, due to lighting etc. Do what I can to help. Sargent Art-Colored Pencils. Subtle colors with a variety of shade and hue variations. Features color coordinated barrels matching each lead. For artists and illustrators of all ages. UPC: 042229272516. ROYAL BRUSH-Artist Premier Set: Drawing. This set is perfect for artists at all levels. Conforms to EN71 and ASTM D4236. Browse By Categories. 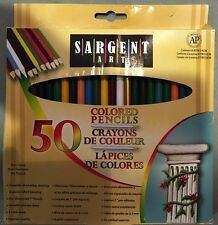 Sargent Art Inc. SAR227251 Sa Colored Pencils 50 Color Set. MPN: SAR227251. 7" Long assorted colored pencils. Category: Office, Arts & Crafts, Crayons, Markers, and Colored Pencils. "Sargent Art-Colored Pencils. Subtle colors with a variety of shade and hue variations. Features color coordinated barrels matching each lead. For artists and illustrators of all ages. Imported.". 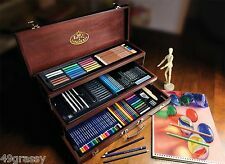 This Drawing Pencil Art Set is extensive collection of fine art materials in stunning dark-toned wood cases. This set exude quality and make a terrific gift for anyone interested in art. Drawing Pencil Art Set. Brand new. Never opened. Please look closely at the pictures for details. Royal brush-artist premier set: sketching drawing. Conforms to ASTM D4236 and EN71. · Includes one artist drawing guide. · Beautiful cantilevered artist chest. · This set has everything you need to be an artist. Shuttle Art is THE FIRST band who create 136 colored pencils, the most colors in the daily used and economical market. Our aim is to let every art lovers own an abundant coloring set to do your favorite coloring. Royal brush-artist premier set: sketching & drawing. Conforms to ASTM D4236 and EN71. Includes one artist drawing guide. Beautiful cantilevered artist chest. This set has everything you need to be an artist. Features color coordinated barrels matching each lead. 50 Colored Pencils for artists and illustrators of all ages. 50 colored pencils - 48 different colors, with an extra white pencil & extra black pencil. Trending at C $9.14eBay determines this price through a machine-learned model of the product's sale prices within the last 90 days. Get 60 vibrant colored pencils from Positive Art and let your artistic side show. Draw, Sketch and Color The versatile Positive Art set is made with 3.3mm, fade-resistant lead that’s perfect for drawing, shading, blending and sketching. The wood case has a hole (pictures 4 & 5). The rest looks good. 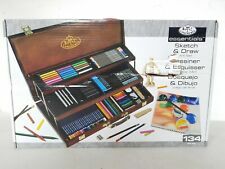 Beautiful cantilevered artist chest Royal brush-artist premier set: sketching & drawing. Conforms to ASTM D4236 and EN71. Includes one artist drawing guide. These were manufactured to be used in the USA. Royal brush-artist premier set: sketching & drawing. Conforms to ASTM D4236 and EN71. Includes one artist drawing guide. This set has everything you need to be an artist. Add to Favorite. We do not accept P.O. Boxes. Our electronic products are only designed for use within the USA (110V). Using a converter is at your own risk. We're happy to help. Our electronic products are only designed for use within the USA.